Easy way to preserve summer fresh corn and chilies. 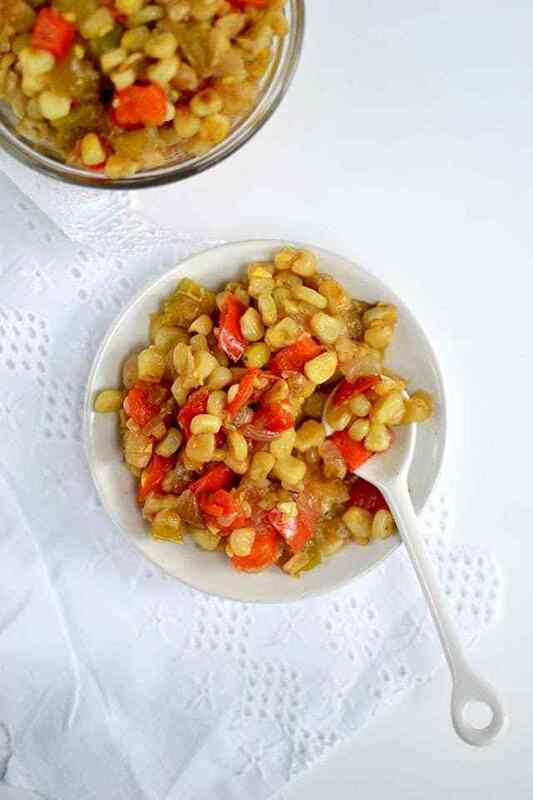 This roasted confetti corn can be used in different dishes. Heat a large nonstick skillet over high heat. Add the corn and cook for 4~6 minutes or until they turn dark brown in places and begin to smell 'roasted', stirring often. Add the onions and peppers, and cook for 4~5 minutes or until the veggies soften. Stir in the garlic, cumin and 1cup of water, season with salt and pepper. Simmer for 8~10 minutes or until all of the liquid evaporated and corn begins to brown again. Remove from heat and cool completely. How to Freeze: Once completely cooled, spoon the mixture into resealable freezer bags or freezer jars. Make sure to leave room for expansion. Remove the excess air from the freezer bags, if using, by laying them flat and squeezing out. Label bags or jars. Stack the bags flat for an efficient storage. Thaw and Use: Defrost the food in the bags or jars before using.